The world music scene is no stranger to major collaborations between great artists from different genres and countries. So it should be no surprise that now it's the turn of Mali and Brazil in the persons of Toumani Diabate, Arnaldo Antunes and Edgard Scandurra to forge something new. The resulting concert will be held on 12 April at London's Union Chapel (as part of La Linea 13, the London Latin Music Festival). Support will come from Family Atlantica. Following a collaboration at the 2010 edition of the Brazilian Back2Black festival in Rio de Janeiro, Grammy awarding-winning Kora player Toumani Diabaté invited Brazilian songwriter, poet and performing artist Arnaldo Antunes and guitar-hero Edgard Scandurra to Mali to record with him. As one of the most influential African musicians of the 21st century Toumani Diabaté needs no introduction. The 71st generation of his family to play the kora, he has released over 10 solo and collaborative albums, winning the Best Traditional World Music Album at the Grammys in 2010 and 2011. Arnaldo Antunes is a legendary Paulistina (native of Sao Paulo) who rose to fame in the early 80s as the driving force behind Titas, one of Brazil's most influential and popular rock groups of the 80s. Since leaving them Arnaldo continues as a successful solo artist, internationally respected poet and serial collaborator working across music, literature, dance and audio-visual media. It's Arnaldo's embrace of pop culture and how this connects with the avante-garde that makes him the embodiment of eclectic, cosmopolitan Sao Paulo and has seen him labeled as Brazil's answer to David Byrne. Edgard Scandurra is a Paulistina guitarist, composer and singer who was a founder member of Ira!, one of the most important contemporary Brazilian rock groups. Listed as one of the 100 Greatest Brazilian Artists by Brazilian Rolling Stone, like Arnaldo he's a regular collaborator with the new generation of Brazilian musicians. 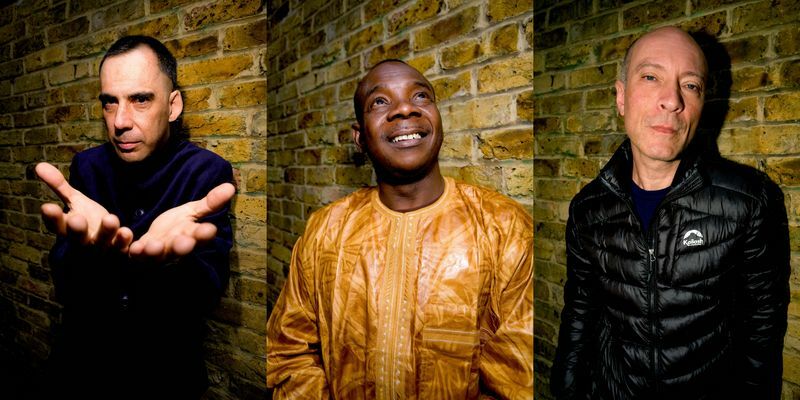 Arnaldo and Edgard arrived in Mali in April 2011 with a collection of songs they had written together. With the Malian musicians they combined rock 'n' roll, African roots and blues to create an uplifting Afro-Brazilian fusion that celebrates the spirit of collaboration and connects Mali and Brazil in a way that blurs geographical and musical boundaries. The songs they recorded became the album 'A Curva Da Cintura' which was released by London-based Brazilian imprint Mais Um Discos in the summer of 2012. Toumani's sublime kora playing proved to be the perfect contrast to Arnaldo's sombre almost mechanical voice and adds a poignancy to ballads such as "Grao de chaos", "Psiu" and Toumani's composition "Kaira". With Toumani leading the ballads, his son Sidiki features on the album's more lively numbers. His rapid kora playing intertwines with Edgard's guitar to propel both the title track and "Cara" forward, whilst the opening track sees him modulating his kora with wah-wah proving he has the pioneering spirit of his father. Also featured are AfroCubism band member Fode Lassana Diabaté on balafon and Zoumana Tereta who adds his guttural soku fiddle playing and vocals to "Ir Mao" to show that there's as much reason to believe the blues came from the Niger Delta as Mississippi. Arnaldo describes working with the Malian musicians: "Their music is very different from ours … based on the sound of an instrument together with improvised singing – they build a musical base and both the melody and lyrics are improvised. It's been a rich cultural experience for both of us". This unique collaboration will now return to London for a show at the Union Chapel on Friday, 12 April 2013, kicking off la Linea 13, the London Latin Music Festival. While A Curva Da Cintura unites Mali and Brazil, the support comes from a group offering another musical take on the trans-Atlantic collaboration, this time uniting West Africa and Venezuela, via London. Family Atlantica, a diverse host of heavyweight musicians from both sides of the Atlantic, are led by London-born Jack Yglesias, producer, multi-instrumentalist and a veteran of The Heliocentrics, and his wife Luzmira Zerpa, traditional Venezuelan musician, poet and singer with a magical voice acclaimed by Manu Chao. The group's eponymous debut album is released by Soundway Records in March 2013. LA LINEA is The London Latin Music Festival which takes place each April in a range of venues across central London from clubs to concert halls. Now in its 13th year, it is a twenty first century presentation of all that is best and current in contemporary Latin music, from hip-hop to classical and all manner of points of connection in between. LA LINEA was created by Como No in 2001 to showcase the Latin contribution to the wider musical world and to celebrate new artists, new collaborations and new projects. It also recognises and responds to London's growing status as one of the world's great Latin cities, home to many Latin artists and a hungry and diverse audience. LA LINEA is supported using public funding by the National Lottery through Arts Council England.